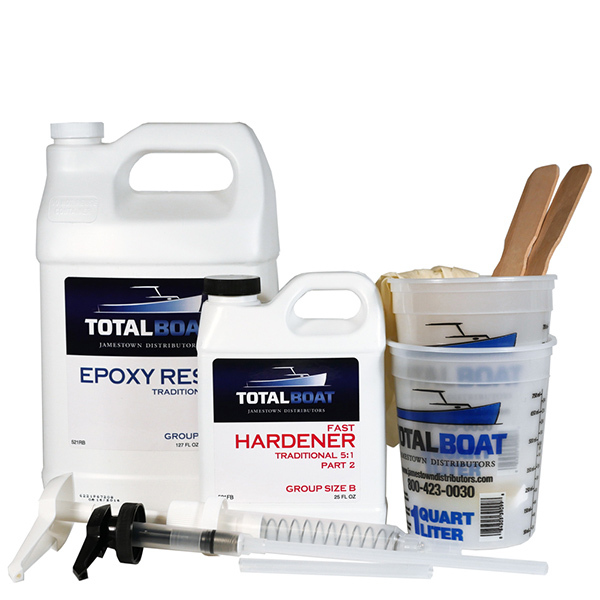 TotalBoat epoxy kits contain enough 5:1 Traditional Epoxy Resin and 5:1 Fast or Slow Hardener to tackle many projects. You also get calibrated mixing pumps, stir sticks, mixing cups, and a pair of latex gloves. Choose from Quart, Gallon, and 5.45 Gallon kits with our Fast or Slow hardener. Either of the 5:1 Fast and Slow Hardeners mixed with 5:1 Epoxy Resin cures to a slight amber color. Not intended for clear coat applications. (See TotalBoat Crystal Clear Epoxy for clear coating). B (Gallon Kit) 127 fl. oz. 25 fl. oz. 152 fl. oz. Have a chainplate that busted out of its bulkhead? A motor mount that came unmounted? Delaminated deck material? Cracks in your cuddy? No matter what shape your ship’s in, there are several projects epoxy can handle. It’s strong and won’t shrink in the face of daunting repairs. Literally. There’s nominal shrinkage, especially in larger repairs like replacing large sections of laminate. TotalBoat 5:1 Epoxy cured to a high-strength, water-resistant solid ideal for use in a variety of epoxy repair and fiberglass projects, including coating, bonding, and laminating. Add our fillers to the resin/hardener mix to get a strong adhesive, or a fairing and filleting compound that sands easily once cured. Whether you’re reinstalling berth frames and bulkheads, or you have an old wooden boat that needs some new skin, there’s enough stuff in our kits to make tough projects easier. You get the 5:1 Epoxy Resin and your choice of either Fast or Slow Hardener. Use the Fast Hardener in cooler temperature conditions to give you adequate working time and to speed up the curing time. The Slow Hardener extends the working and cure times in warmer temperatures. These complete, project-ready kits also have a set of calibrated pumps to dole out the resin and hardener in the precise mix of 5 parts resin to 1 part hardener, two stir sticks, two mixing pots, and a pair of latex gloves. If you only need the 5:1 Epoxy Resin and Hardener, there’s a kit for that, too. Still have another brand of resin or hardener left over from previous projects? You can use the TotalBoat 5:1 Epoxy system interchangeably with other traditional 5:1 marine epoxy systems, letting you can mix and match to use up those leftovers. After measuring, just give the mix a good stir for about two minutes to combine thoroughly before applying. When all is said and done—and cured—you’ll get professional results without the professional’s bill.